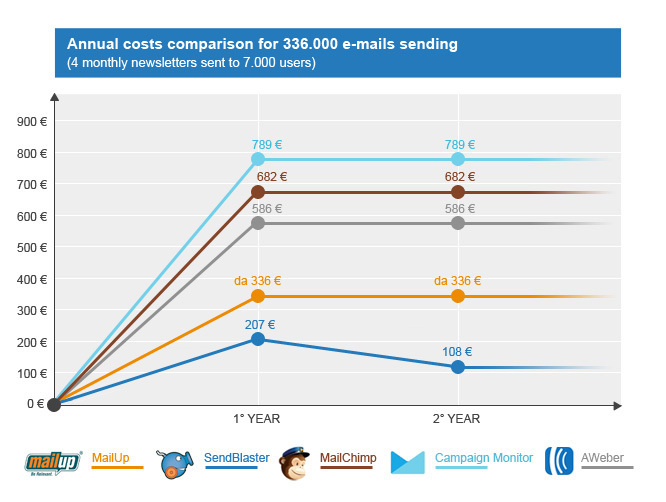 When it comes to email marketing, it's very important to establish what is the most cost effective solution for managing and sending your newsletter. First, you must decide whether to opt for a mass mailing software to be used on your computer, or to rely on a web service. The main difference is that with an online service you will have to pay a fixed fee depending on the amount of addresses and messages that you handle each month; while with a software that cost is zero, since the license is purchased with a single payment and no other recurring fees. Now let's crunch some numbers with an example. As you can see, the price of the following years is further lowered because the license SendBlaster is a one-time cost.